In 1999, the Baltimore Orioles played the Cuban National baseball team, helping lay the groundwork for this week’s remarkable events in Havana. A historic baseball game. A Havana backdrop. Sports media members role-playing—like kids flopping around in their daddy’s suits—as fulminating Cold Warriors. Yet amidst the bloviations from a bunch of wannabe Whittaker Chambers, a sense of hope that old wounds could heal, with the power of sports as salve. 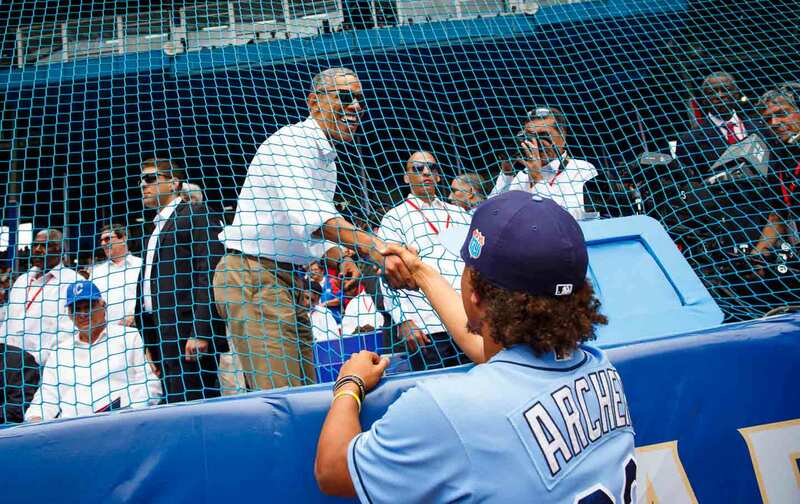 I could very easily be describing the historic events of Tuesday, as the Tampa Bay Rays and Cuban National team played in the island nation’s capital with the Obama family and Raúl Castro in the stands. But I’m not. On this day it is worth remembering the last time Major League Baseball was in Cuba, which took place in far more perilous times. It is worth remembering the actions of the Baltimore Orioles and team owners, the Angelos family, who were slandered, threatened, and risked the brand of their beloved team for political principle. It was 1999 when the Cuban national squad played the O’s in an unprecedented two game series held in Havana and then Baltimore at Camden Yards. Unlike this week, when baseball was staged as a symbol of the belated thaw in relations between the two countries, the game in 1999, pushed through by Peter and his son John Angelos, took place in a climate just three years after President Bill Clinton had signed the Helms-Burton embargo law aimed at stripping Cuba of its ability to rebuild after the fall of the USSR. Yes, that would be Helms as in North Carolina’s proudly racist Senator Jesse Helms, and Burton as in Indiana congressman/right-wing conspiracy maven Dan Burton. That would also be Bill Clinton’s signature. The punitive Helms-Burton Act did little more than exacerbate the suffering and privation of the Cuban people. It also created a siege mentality that made any sort of grassroots democratic organizing in opposition to the Castro regime a near-impossible task, with every protest painted as aiding US imperial strategy. To stage such a home-and-home series was courageous and, if it was going to happen, only Peter Angelos amongst the fraternity of owners, would have done it. The elder Angelos has been subject to a great deal of criticism for his baseball moves over the years, but one undeniable fact is that, as a sports owner, he is a bird of a different feather. He made his fortune as a labor lawyer and in 1994—much to the rage of Commissioner Bud Selig—even sided with the players in the strike/lockout that cancelled the World Series. Angelos is also a political progressive in an ownership fraternity where to be anywhere to the left of John McCain is tantamount to calling for a dictatorship of the proletariat. The game in Havana resulted in a thrilling 11th inning 3-2 Orioles victory. In Baltimore, the contest was protested, with two demonstrators rushing the field, one fighting—and getting body claimed—by a Cuban umpire. The Orioles lost 12-6. The Angelos were roundly criticized and Thomas Boswell of The Washington Post wrote that the Orioles would now “pay a price in shame” for their lackluster play, as if this exhibition game was the 1980 Winter Olympics. But unlike those in the world of sports and politics who wanted—and want—the Cuban team to be humiliated for playing “our game” and the Cuban people to suffer in perpetuity, the Angelos family felt a commitment to a different path. This week’s game might have been just to lay the groundwork for US corporations—Major League Baseball among them—to grab their piece of Cuba. But in 1999, the Angelos were “prematurely pro-Cuban” because it was just the right thing to do. It is gratifying to see the Cuban and American people able once again to come together over our shared cultural interests, and it is particularly of note that baseball serves again today as the vehicle for creating a spirit of community just as it did 17 years ago. While our series was and will be unprecedented, the credit for the groundbreaking nature of today’s game and of our series many years ago should properly be assigned to those individuals in both the US and in Cuba who long before the historic baseball games of 1999 advocated without success and without pause for the normalization of relations that has finally arrived and for an end to the toxic embargo and travel ban that hopefully will be discarded in short order as well and did so at a time when such sentiments were far less popular than they are today. “Far less popular” undersells how far outside the mainstream planning such a baseball exhibition was at the time. Now, in contrast, we now have strong majorities in both countries that want to see the damnable Cold War posturing finally end, 25 years past its due date. Now we have the opportunity to reclaim a shared history long erased by Cold Warriors who wanted us to believe that baseball is as American as apple pie and ignore the fact that it also is as Cuban as arroz con leche. Now we can turn on ESPN and amid some very questionable decisions in its coverage, see something as beautiful as Rays pitcher Chris Archer speaking from a Havana dugout about how moved he was by his interactions with the Cuban people and his recognition about how remarkable they are given the levels of privation. It was possible to feel that maybe—just maybe—a different world is in fact possible. Time will tell whether Tuesday’s game will be remembered as a baby step or a giant leap forward, but it was a step in the right direction for people who don’t think walls, guns, and embargoes will make the world a better place.